Kopaovens come with many different advantages. One of many advantages is the durable design of Kopa smoking ovens which results in long life span of the charcoal ovens. Furthermore, practical design assures safe and efficient workflow in the kitchen. With Kopaoven, heat is easily regulated with two hatches. When one would like to ignite the fire, both hatches have to be open, but when the desired temperature is reached in the oven, the bottom hatch should be closed and the heat is regulated with the upper one. With this, constant temperature is provided in the oven and food is prepared to the exact standard desired. Kopa smoking oven is a versatile hot and cold charcoal smoker/oven with added speed of electrical heating. Kopa smoking oven is traditional wood oven for the restaurant of the 21st century. With slow cooking, food will remain moist and juicy, furthermore the smoker will add delicious smoky aroma to the dishes prepared in the Kopa charcoal oven. In this oven different types of food can be prepared. From meat to fish, as well as vegetables and even some side dishes can be cooked in Kopa charcoal oven. One can also turn off the heat and leave the smoke for reaching a cold smoker for smoking fish, sausages or cured meats. Oven is electronically controlled for the ease of use. Kopa charcoal ovens are suitable to incorporate to different kitchens. Customers can choose from different colours of Kopa charcoal ovens. In addition, the steady radiation in the oven interior makes the charcoal distribute heat quickly and evenly, which gives the dish substantial consistency. Last but not least, grilling in Kopa charcoal oven is also time-efficient. It saves the cook at least 30% of time compared to grilling on an open charcoal grill oven. Just to illustrate, a medium-rare 4 centimetre beef steak weighing 350g will take only 4 minutes to prepare. 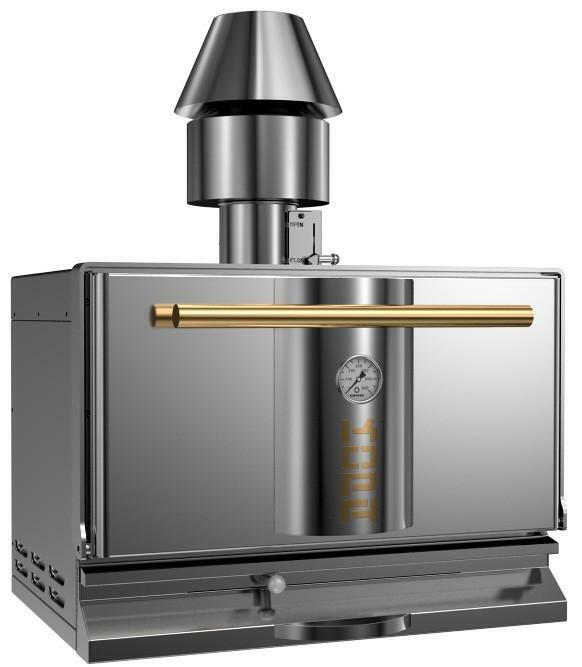 Are you looking for a new charcoal oven for your restaurant? If any further questions popped up, please do not hesitate to contact us, we will be happy to help you with additional information.